Aim: To compare the microleakage of four different root end filling materials with or without root end bevels using dye penetration technique under stereomicroscope. Materials and methods: Subsequent to decontamination and decoronation, 90 human maxillary central incisor were instrumented and obturated with gutta percha using lateral compaction technique. Ten samples were used as control group where no retrograde cavity preparation was done except removal of 3mm of apex at 0 degree bevel and 45 degree bevel in 5 samples each. 40 teeth were apically resected at an angle of 45 degrees and the remaining 40 teeth were subjected to 0 degree resection to the long axis of root. Root end cavities were then prepared to 3 mm depth. The samples were thus divided into nine groups with ten samples each in the eight experimental groups and ten samples in the control group. In each experimental group, root end cavities were filled with one of the following materials: Silver Amalgam, Intermediate Restorative Material (IRM), Mineral Trioxide Aggregate(MTA) and Giomer. Following this, the teeth were stored in incubator for 2 weeks. The samples were coated with nail varnish and after drying were immersed in Indian ink dye for 72 hours. The teeth were then rinsed, sectioned longitudinally and observed under stereomicroscope. The depth of dye penetration was measured in millimetres. Results: The results showed that microleakage was found to be least in case of MTA followed by IRM, Silver Amalgam and Giomer. Regarding the choice of apical preparation of bevel as demonstrated in this study, retrograde preparations without bevel demonstrated less leakage as compared to retrograde preparations with the use of bevel for all the test materials. Conclusion: MTA as root end filling material without bevelling the root end may be considered as a clinical procedure of choice with predictable clinical results. 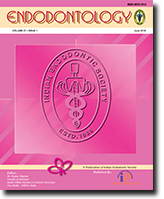 Introduction: The cause and effect of sodium hypochlorite and chlorhexidine gluconate accidents on vital tissues like skin, subcutaneous tissues, nerves, periodontal tissues have been extensively addressed through case reports; however, the pathological changes in bone after the their inadvertent extrusion through apical foramen during routine root canal treatment have not been investigated. Learning more about physical and histologic changes in bone might lead to treatment protocol changes. The purpose of this study was to compare the histological effects of sodium hypochlorite and chlorhexidine gluconate on the alveolar bone. Aim: To compare the effect of 3% Sodium hypochlorite and 2% Chlorhexidine gluconate on goat bone. Objective: To assess the histopathological changes in the goat mandible exposed to 0.5ml of 3% Sodium hypochlorite and 2% Chlorhexidine gluconate for a period of 30 minutes. Methods: A freshly cut goat mandible was obtained and immediately cut into 4 mm blocks which were further sectioned into 2×2×2mm blocks. Adjacent surface were selected for the shallow injection of sodium hypochlorite and chlorhexidine gluconate and saline. Histopathological evaluation of the bone specimens were conducted under nine parameters. Results: Histologically, both sodium hypochlorite and chlorhexidine gluconate causes detrimental effects on bone. However, the results indicated that sodium hypochlorite, causes more degradation to the bone as compared to chlorhexidine gluconate. Calcified elements such as cortical bone remains unaffected. Cleaning and shaping have been performed by numerous file systems. It is particularly difficult to shape complex root canal anatomy with stainless steel instruments. However, NiTi instruments are used routinely as they are more flexible, strong and provide more ease in operation. The present study aims at comparison of two endodontic file systems [ProTaper and HERO] using Finite Element Models analyzed by commercial software ANSYS 11.0 Workbench. The models were subjected to bending and torsion by applying moments at one end while the other end was kept fixed. Non-linear material behavior of Nitinol and complex Von Misses stress was considered during the analysis. Maximum stress of 631 and 390 MPa was observed in ProTaper and HERO file model when subjected to axial rotation of 20° simulating torsional load. Bending conditions were simulated by applying lateral rotation of 20° on free end. Transient analysis was carried out to obtain the moment rigidity curve and was found to be identical for both the file systems. Based on obtained results, it was concluded that the HERO file model is more flexible as compared to ProTaper file model. Further study is being conducted to prove it statistically by altering the volume of the various juices used. This study can open up new pathways in search of herbal alternatives that can be used against E faecalis that is known to cause endodontic treatment failure. Calcium Hydroxide has for long been the gold standard for Vital Pulp Therapy. Thus the aim of this study was to comparatively evaluate the effect of Biodentin™ Vs. Calcium hydroxide on exposed human pulp. The effect of the materials on Maxillary human premolars destined for extraction and after histological analysis it was seen that the quality and quantity of calcific barrier formation with Biodentin™ was superior to that of Calcium hydroxide. The purpose of this study was to evaluate the Antibacterial Effect against Enterococcus faecalis(E.faecalis) and Solubility rate of a Zinc Oxide-Eugenol based (ZnoE) (PrimeDent) and a resin based (AH Plus) sealer after the incorporation of an Amoxycillin and Clavulanic Acid (ACA) (AugmentinR). The antibacterial activity was evaluated by the Direct Contact Test (DCT) when AH plus and Zinc Oxide-Eugenol based sealer comes in contact with Enterococcus faecalis. Growth of the microorganisms was measured every hour for first 8 hours at the end of the 1st day, 3rdday, and 7th days. To evaluate the Rate of Solubility, samples were weighed before and after placing them in a still water bath. Samples were weighed on a Precision Balance Machine at the end of the 1st day, 3rd day and 7th day. The resulting weight loss was taken to be the parameter for the Solubility of the sealer. Zinc oxide eugenol sealer with ACA showed higher antibacterial activity as compared to the AH Plus sealer with ACA. Zinc oxide eugenol sealer with ACA have higher solubility in distilled water but within the limits of BS EN ISO 6876 (2001) standards when compared with AH Plus sealer with ACA. 3Dimensional obturation is a very important contributor towards the success of endodontic therapy. Thermal obturating techniques are gaining wide acceptance to obtain 3D seal. Of these, carrier based obturation techniques appear to be easier and provide good sealing ability and are less time consuming. The question arises whether these carrier based obturators are effective in providing gutta percha seal at the apical 3rd in curved canals or does the plastic carrier get exposed. So the aim of this study was to compare effective gutta percha sealing ability by using two different core based thermal obturationsystem i.e. Thermafil and Soft Core obturations systems. A total of 30 maxillary molars were collected and canals were prepared using ProTaper (Dentsply, Maillefer) in a crown down manner. The teeth were randomly divided into two groups. The teeth were obturated as follows: Groups 1 with Thermafil (Dentsply, Tulsa), Groups 2 with Soft Core (Soft Core System, Copenhagen, Denmark) and then the samples were sectioned at 1, 3 & 5mm apically by a low speed diamond disk and evaluated under stereomicroscope. The results revealed that none of the carrier based systems showed good sealing ability at the apical 3rd but Thermafil showed lesser exposure of the carrier than the Soft Core. Hence, this was concluded that both the systems did not show absolute ability to seal the apical third with gutta percha. Aim: The aim of this study is to compare the antibacterial efficacy of Calcium hydroxide with and without addition of herbal medicaments like turmeric and neem extracts against Enterococcus faecalis. Materials and Methodology: Calcium hydroxide and herbal extracts were prepared and the samples were divided into 6 groups. Group A – Calcium hydroxide + saline, Group B – Calcium hydroxide + Turmeric extract, Group C – Calcium hydroxide + Neem extract, GROUP A1 – Normal saline, GROUP B1 – Turmeric extract, GROUP C1 - Neem extract. Enterococcus faecalis are grown in Brain heart infusion broth (BHI). 3 wells, 4mm in diameter are punched in each media plate and are filled with respective groups of equal volume. After incubation for 24-48hrs, at 37°C, inhibition zones are measured with a sliding caliper. Results: All the statistical analysis was done using SPSS version 18. A p-value of <0.05 was considered statistically significant. Comparison of mean zone of inhibition was done using ANOVA with post-hoc Games Howell test. Conclusion: Within the limitations of the study, all materials showed antibacterial activity against Enterococcus faecalis but Calcium hydroxide and saline combination showed best efficacy against E.faecalis while Turmeric showed least efficacy. Objective: To conduct a comparative evaluation of the sealing ability of two single-cone obturation systems versus traditional gutta percha obturation using a bacterial leakage model. Materials and Methods: Seventy freshly extracted human mandibular incisors with oval canals were selected and decoronated. Shaping and cleaning of the specimens was done with rotary crown down technique and then divided into three experimental (n = 20 each) Group A, Group B, Group C and two control groups (n = 5 each). Split chamber bacterial leakage model was used to evaluate the sealing ability using a E Feacalis strain. Specimens were monitored every 24 hours for 60 days. Results: All groups have shown leakage. Group A showed the best results(9 out of 20 samples). Group B and Group C showed similar results(15 and 17 samples respectively.) Conclusion: C-points/ Smart-paste Bio has shown superior sealing ability as compared to Resilon/Epiphany and GP/ AH Plus. Objectives: The aim of the present study was to assess the relationship between the maxillary sinus floor and the maxillary molar root tips using CBCT. Methods: A total of 30 maxillary first molars and 30 maxillary second molars from 17 patients were examined with CBCT. For each root the shortest distance to the maxillary sinus was determined in sagittal, coronal and axial planes, using in-built measurement tools. Means, standard deviations, minimum and maximum values and frequency of root protrusion were calculated for all roots. Results: The distance between sinus floor and root tip was longest for the first molar mesiobuccal root and shortest for the second molar distobuccal root. Conclusions: Knowledge of the anatomical relationship between the maxillary sinus floor and the maxillary posterior teeth root tips is important for the preoperative treatment planning of maxillary posterior teeth. Internal root resorption is not a common condition, especially in permanent teeth. It is characterized radiographically by a disruption of the canal space, typically ovoid in appearance. This article describes a unique case in which an internal resorptive defect was developed in a maxillary premolar, which had previously been endodontically treated. The use of advanced modalities such as the cone beam computed tomography (CBCT) has an important contribution in the diagnosis and hence, the clinical treatment protocol in this case. After completing non-surgical endodontic retreatment, the canals were sealed withthermoplasticized gutta percha, which remains the most favorable treatment in such cases. The most common type of dental trauma occur in the maxillary incisor region and could cause tooth fractures. Tooth fracture involving the crown and root may need special emphasis regarding endodontic treatment. Many alternative approaches have been suggested, with the aim of developing a one-step procedure for the completion of the endodontic treatment. One of these alternatives, Biodentine, has been introduced as a dentin substitute. The endodontically treated teeth are often restored by using a post and core. The use of everStick glass fiber as post offers a special feature having glass fibers to be flexible but does not fray from within the matrix when it adapts to a surface. The aim of this article is to show the management of fractured maxillary incisor involving crown and root with Biodentine, everStick glass fiber as post and composite resin followed by fixed prosthesis in order to rehabilitate the maxillary incisor region. Variations in canal morphology in fused teeth presents a clinical challenge when endodontic treatment is planned. Presence of pulpal remnants at the region of isthmus between the two root canals in fused teeth can compromise the success of endodontic treatment. To achieve a technically satisfactory treatment outcome, the clinician must have adequate knowledge of the internal canal anatomy and its variations to completely debride and obturate the root canal system. The aim of this case report is to present the endodontic management of left maxillary central incisor fused to a supernumerary tooth with the help of EndoVac. In the present case, we have used Endovac for establishing the presence of communication between the two root canals and for disinfecting the same. Long term success of an endodontically treated tooth depends on post endodontic restoration which in turn is buttressed by foundation restoration such as post and core. However, use of a post is dictated by the root canal anatomy. C-shaped canal configuration most often seen in mandibular molars, makes endodontic treatment complicated as it is difficult to diagnose, shape, clean and obturate. Advanced diagnostic aids like CBCT can be used to confirm the presence of C- shaped canals. Another challenge in such teeth is post-endodontic restoration if there is gross coronal tooth tissue loss. Post placement may be unsafe in C-shaped canals as it may lead to strip perforation. The present case report discusses the successful, endodontic and postendodontic management of a mandibular left second molar with C- shaped canals in a 32 year old female patient. An endocrown may be a valuable option for post endodontic restoration of a mutilated mandibular molar with C- shaped canals as they reinforce the tooth without traditional post systems. Reestablishing the anatomy of affected teeth is the purpose of restorative dentistry. Thus the use of fragments from natural teeth warrants a highly effective restorative method. This case series describes the successful management of fractured maxillary and mandibular anterior teeth using biological posts made from human teeth. Following Endodontic treatment of theteeth, the coronal root space was modified to receive a biological post. Freshly extracted anterior teeth were selected. Using a diamond disc teeth were sectioned mesiodistally, and shaped so as to simulate the thickness and length of the post, and then cemented in the affected teeth. Core build up was done with composite, and porcelain fused to metal crowns were cemented. Patient were asymptomatic on the follow-up visits and radiographic evaluation revealed normal periradicular structure. As biological posts provide excellent adhesion and have resilience similar to natural tooth structure, they can be good alternatives to conventional post systems. Regeneration of lost tissues within the oral cavity seems to be the trend of dental professionals and numerous advances have been made in that direction. Unfavorable outcome following root canal treatment can be attributed to many reasons, butsometimes even a well-performed treatment can lead to non-healing of peri radicular lesions necessitating a more aggressive and invasive periapical surgery. PRF(platelet rich fibrin), a second generation platelet concentrate containing viable platelets has garnered widespread attention because of its ability to provide multiple growth factors. The present case report aims to evaluate the efficacy of minced PRF along with Xenograft in the treatment of a non-healing periapical lesion. The results were evaluated based on the clinical symptoms and radiological (bone fill) findings. It is seen that PRF results in improved healing and excellent bone fill when used in conjunction with bone grafts. Dens invaginatus, a developmental anomaly caused by infolding of the dental papilla during early morphogenesis. Maxillary lateral incisors are the most commonly affected teeth. Presence of dens invaginatus in mandibular central incisor is very rare occurance. Unsual crown morphology was seen clinically in relation to right mandibular central incisor, Combination of endodontic and surgical treatment performed on mandibular right central incisor associated type III dens invaginatus. Nine month follow up was done.